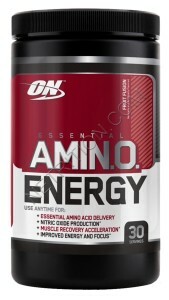 If you’re too sensitive to caffeine to use most pre-workout drinks, then I recommend you give Essential Amino Energy a try. It only has 50 mg of caffeine per scoop along with various aminos, including nitric-oxide boosters and beta-alanine. I prefer caffeinated pre-workout drinks, but this is the best low-caffine pre-workout that I’ve been able to find.